The whole point of reviewing is to be critical. To be objective. To be truthful. 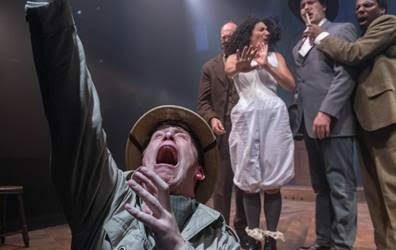 I am upholding all of these principles when I say that Taproot Theatre’s final production of the season, an adaptation of Ken Ludwig’s Baskerville, is the funniest thing I have seen in years. I spent two hours and ten minutes laughing. I left the theatre chuckling, and I did a bang up job of alarming those around me as I spent the next hour or so cackling intermittently to myself in the aftermath. The Hounds of the Baskervilles is one of Arthur Conan Doyle’s most beloved stories, with countless different adaptations created over the years. I’ve seen plenty of them, and yet this production of Baskerville, directed by Scott Nolte, might be my new favorite. Sherlock Holmes and Doctor Watson are invited to Devonshire in order to investigate the inexplicable death of Sir Charles Baskerville, who seems to have dropped dead of fear after being chased by the mythical Hound of Baskerville. Michael Patten captivates as Sherlock Holmes, sending the audience into peels of laughter with a mere change of tone or the quirk of an eyebrow, while Reginald André Jackson’s more serious Watson elicits no shortage of laughs himself. Nick Watson plays a handful of characters, notably the American Sir Henry, heir to Baskerville Hall, and Detective Lestrade. Watson uses his entire body to humorous effect, prompting hilarity not just due to what he says, but how he walks, stands, and best of all, falls. This mastery of physical acting is his most memorable contribution to the production, more than making up for his cringe-worthy accent as Detective Lestrade. However, it is Eric Hampton and Elizabeth Keck who stole the show. They play the bulk of the thirty five characters who appear on stage, and they nail the accents, mannerisms, and even facial expressions of each. Every movement, (and at one point, lack of movement), that they take part in during the entire production could be a contender for the funniest moment of the play. In short, they were both utterly brilliant. (It must also be noted that Melanie Burgess and Nina Bice did a fantastic job of creating those thirty five different costumes, many of which were created to fit over or under several others as Hampton and Keck ran around stage). Other than a minor hiccup with the lighting early on (the HDMI connection confirmation was briefly projected onto the stage) and a couple of stuttered lines, this production was a flawless Study in Hilarity. Baskerville is a must-see for anyone, of any age, who wants to laugh until their stomach hurts, and who doesn’t mind getting on their feet for a standing ovation. Maybe I’ll see you there, this reviewer will certainly be attending again.